Vodka is a distilled beverage composed primarily of water and ethanol, sometimes with traces of impurities and flavorings. 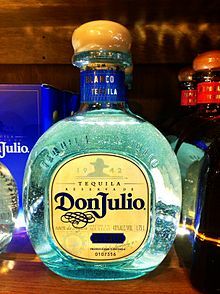 Traditionally, vodka is made by the distillation of fermented cereal grains or potatoes, though some modern brands use other substances, such as fruits or sugar. Since the 1890s, the standard Polish, Russian, Belarusian, Ukrainian, Estonian, Latvian, Lithuanian and Czech vodkas are 40% alcohol by volume ABV (80 proof), a percentage that is widely misattributed to Dmitri Mendeleev. The European Union has established a minimum of 37.5% ABV for any "European vodka" to be named as such. 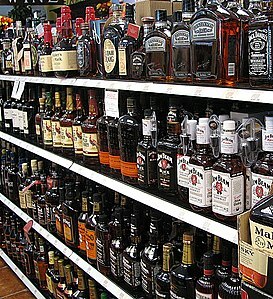 Products sold as "vodka" in the United States must have a minimum alcohol content of 40%. Even with these loose restrictions, most vodka sold contains 40% ABV. For homemade vodkas and distilled beverages referred to as "moonshine", see moonshine by country. Jasper Newton "Jack" Daniel (c. September 5, 1850 – October 10, 1911) was an American distiller and the founder of the Jack Daniel's Tennessee whiskey distillery. According to one source, he was born in September 1850, in or around Lynchburg, Tennessee. Daniel was the youngest of ten children born to Calaway and Lucinda (née Cook) Daniel. Jack Daniel never married and did not have any children. However, he took his nephews under his wing – one of whom was Lemuel "Lem" Motlow (1869–1947). Lem, a son of Daniel's sister, Finetta, was skilled with numbers, and was soon doing all of the distillery's bookkeeping. In 1907, due to failing health, Jack Daniel gave the distillery to two of his nephews. Daniel died from blood poisoning at Lynchburg in 1911. A mint julep served in the traditional silver cup. The Bunnahabhain Distillery (Scottish Gaelic: Taigh-staile Bun na h-Abhainne, [t̪əˈs̪t̪alə punəˈhavɪɲ]) was founded in 1881 near Port Askaig on Islay. The village of Bunnahabhain was founded to house its workers. The distillery is owned by Distell. Mojito (/moʊˈhiːtoʊ/; Spanish: [moˈxito]) is a traditional Cuban highball. Redbreast is a brand of single pot still Irish Whiskey produced by Irish Distillers. It was originally produced by Gilbey's, a Dublin spirits merchant using distillate sourced from Jameson's Bow Street Distillery. In the 1980s, the brand was purchased by Irish Distillers, the producer of Jameson Irish whiskey. It is the largest selling single pot still Irish whiskey in the world. Smithwick's (/ˈsmɪðɪks/) is an Irish red ale-style beer. 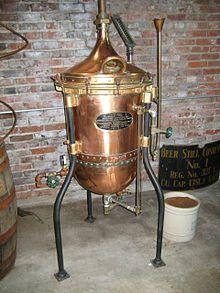 Cork Distilleries Company was an Irish whiskey distilling company. It was formed in 1867, when four Cork distilleries, Daly's, the Green, North Mall, the Watercourse were amalgamated under one company to form the Cork Distilleries Company. In 1868, these were joined by another Cork distillery, James Murphy's Midleton Distillery. The company existed until 1966, when the Cork Distilleries Company merged with two other Irish distillers, John Powers & Son, and John Jameson & Son to form Irish Distillers. Rum and Coke, or the Cuba Libre (/ˈkjuːbə ˈliːbreɪ/; Spanish pronunciation: [ˈkuβa ˈliβɾe], "Free Cuba"), is a highball cocktail consisting of cola, rum, and in many recipes lime juice, generally served with ice. Traditionally, the cola ingredient is Coca-Cola ("Coke"), and the alcohol is a light rum such as Bacardi. The drink may be made with various types of rums and cola brands, and lime juice may or may not be included. The Mai Tai is an alcoholic cocktail based on rum, Curaçao liqueur, and lime juice, associated with Polynesian-style settings. The following stub articles can be expanded. Standards of Identity for Distilled Spirits. U.S. Government Publishing Office.